Combine Cape Town, South Africa’s second largest city, with the country’s best wildlife including the penguin colony on the Cape Peninsula and a multi-day safari at one of the private game reserves bordering Kruger National Park. This tour concludes at Victoria Falls, a stunning natural site and one of the seven natural wonders of the world. Adding to the majesty of Kruger Park safaris are the surrounding private game reserves such as Sabi Sands and Timbavati. Over the last 20 years the fences between the reserves have been removed allowing the animals to roam freely between the Kruger National Park and these private reserves. The removal of these boundaries has afforded visitors to the Kruger Park with the best Big Five safari experience South Africa has to offer. Choose to stay in a 3 star hotel in the nearby town of Hazyview if you prefer the proximity of shops and restaurants, or choose a quiet 4 or 5 star safari lodge located within Sabi Sands Game Reserve. Safari program, vehicles and additional activities differ slightly from lodge to lodge. Victoria Falls also known as “Mosi oa-Tunya” (the smoke that thunders) is positioned almost exactly half way along the mighty Zambezi River’s 2700 km (1678 mile) journey from its source to the sea. Here the river plunges headlong into a 100m (328 ft) vertical chasm spanning the full one-and-a-half kilometer (~1 mile) width of the river, creating the biggest curtain of falling water in the world and also one of the seven natural wonders of the world. * Victoria Falls straddles the border between Zimbabwe and Zambia. We offer accommodation in Victoria Falls, Zimbabwe, at the western end of the falls themselves, or in Livingstone, Zambia, 10 kilometers north of Victoria Falls. Though the Zimbabwe option is more affordable and closer to the falls, travelers wishing to stay in Zimbabwe may want to research the current politcal situation before making a final decision. * In the flood season, February to May, you cannot see the foot of Victoria Falls and most of its face; walks are clouded by mist and are in constant shower. * In the dry season, September to January, up to half the face of the falls may be dry. * Devil’s Pool is safest for swimming in September and December. Local airport taxes that are payable in the country of destination are not included. Taxes and security fees that can be paid at time of ticketing are already included in the quote (if airfare has been included in the quote). Upon arrival in Cape Town, airport reception and transfer in a private vehicle to the hotel. After check in, enjoy the remainder of the evening at leisure. Start today by getting immersed in some of the city’s history and culture on a private city tour. Be aware of seldom seen sights and seldom heard stories about the city’s former inhabitants; previous visitors; beautiful architectural heritage; social, cultural, religious and political history. Afterwards make way to the Cable Car Station for a memorable trip to the top of Table Mountain, one of the Natural Wonders of the World. The views of the city, coastline and Cape Peninsula are in a word: breathtaking. Then return to the hotel and enjoy the remainder of the day at leisure. After breakfast transfer to the airport for a flight to Mpumalanga. Upon arrival, transfer to the game lodge. First Day on Safari: Open safari vehicles with seating for between 6 and 12 visitors head out into the wild under the expert guidance of experienced rangers and insightful trackers. Guests are able to get in close contact with Africa's most exciting wildlife species, and are presented with unparalleled photographic opportunities. Early morning game drive heads out as the sun rises and the bush stirs to life. The ranger and tracker teams search for animals by tracking their spoor, and by listening for the tell-tale signs of activity. The bush has its own language, and it is fascinating to watch those who possess the tools to encode it. Late afternoon game drive commences as the sun burns its way towards the horizon. The animals are now getting more active, many preparing for the great hunt after dark. After sundowners, the drive continues with the aid of powerful spotlights which reveal nocturnal species in another world. On average, approximately 6 hours of game drives per day. Another Safari day starting with morning game drive, followed by free time and late afternoon game drive. Each day will differ in the animals that may be near or ask the tracker to search out animals which have not been seen yet. Last Safari day and last chance to see these remarkable animals in the wild. One never knows what amazing moment will be witnessed. After the morning activity and breakfast transfer to the airport for a flight to Victoria Falls. Upon arrival at the airport transfer to the hotel in Victoria Falls or Livingstone. The rest of the day will be spent at leisure to explore the beautiful surroundings. Overnight in Victoria Falls or Livingstone. After breakfast, set off on a tour of the mighty Victoria Falls. The Victoria Falls – now in its 150 Millionth fantastic year - reaches its zenith around May each year. It’s a truly awe-inspiring experience – the sight, the sound, the smell; the humbling feeling that here indeed is nature’s supreme masterpiece. En route, observe the ‘Big Tree’ where a photography stop will be made. Journey through the rainforest by a qualified guide who will give a brief history of the falls, as well as detailing the flora, fauna, bird & wildlife and other points of interest. Guides are also happy to assist clients with photographs whilst visiting this most spectacular of waterfalls. Raincoats are provided when needed. Overnight in Victoria Falls or Livingstone. This morning, enjoy an extraordinary and exhilarating journey along ancient game trails seated comfortably on the back of nature’s true “king of the beasts” – the elephant! Experience an age old tradition while silently exploring the magnificent Victoria Falls National Park, part of a World Heritage Site in Victoria Falls, Zimbabwe. Enjoy sightings of waterbuck, white rhino, zebra, giraffe and other forms of plains game as well as breathtaking gorge views from elephant-back. The unique view of the spray of the Victoria Falls, a mere 3km (~2 miles) away, will ensure this moment stays for all time. Be witness to this mutually enriching and rewarding relationship between man and elephant in modern day Africa. Sunrise and sunset Victoria Falls Elephant Back Safaris are run daily, promising much more than just a game-viewing experience, but rather a closer insight into the world’s largest land mammal, the African Elephant. Overnight in Victoria Falls or Livingstone. After breakfast, the Chobe Day trip departs to the Chobe National Park in Botswana. Transfer to the Kazungula border to meet a Botswanan guide. From here proceed straight to the morning game viewing along the Chobe River. Tea, coffee & biscuits are provided. The morning cruise ends at around 12.30hrs followed by lunch at a hotel overlooking the river. After lunch, board safari vehicles for an afternoon game drive in the Chobe National Park to enjoy an abundance of wildlife. After the game drive, go back to the Kazungula Border to meet the Zimbabwean/Zambian guide for a return transfer to Victoria Falls, arriving at approximately 18.30hrs. After breakfast transfer to the airport for a connection to Cape Town and flight home or continue with the Yampu Tours add-on of choice. Adventurers and sightseers alike can enjoy a visit to Victoria Falls. Go canoeing on the river above the falls for a relaxing way to enjoy the wildlife, or a take a beautiful sunset cruise. For a little more action try white water rafting on the river below the falls. Take a helicopter ride over the falls, or stay on land and visit the Victoria Falls Hotel for High Tea. Twice the height of the Niagara Falls and the world’s largest curtain of falling water, Victoria Falls will not disappoint. The falls offer many experiences that are once in a lifetime. From bungee jumping to looking over the falls from the water just inches away from the official drop, Victoria Falls is a must! Arathusa Safari Lodge is unique and highly sought after by visitors because of its prime location within the Sabi Sand Reserve, adjacent to the unfenced Kruger National Park. Arathusa offers an exceptional safari experience – expect a high concentration of an assortment of game, including the Big Five, and frequent leopard sightings. The lodge is situated on a large waterhole, ensuring interesting game and bird viewing from the comfort of the camp. Standard and private luxury accommodation options, exceptional service, value for money and luxury spa services from Arathusa’s Safari Spa are just a few of the things that put Arathusa Safari Lodge in a league of its own. The Ilala Lodge is the perfect base from which to explore one of the World’s Seven Natural Wonders, the majestic Victoria Falls. Accommodation at Ilala Lodge Hotel provides distinguished yet affordable accommodation in a gracious and secluded setting. Ilala Lodge Hotel is ideally situated on the Zimbabwean side of the mighty Zambezi river, where it is the closest hotel to the magnificent Victoria Falls. The falls, recently voted one of the World’s Seven Natural Wonders, are within easy walking distance for guests, as is the Victoria Falls town center. Wild animals often graze on the hotel lawns and restaurant diners can see the spray of the falls in the background while they listen to the majestic roar of “the smoke that thunders” and enjoy Zimbabwe’s finest cuisine in Ilala’s Palm Restaurant. Built of thatch and timber, the Victoria Falls Safari Lodge rises seven levels, giving the impression of a vast open-plan tree house. The spectacular setting can be enjoyed by guests cooling off in a two-tiered swimming pool, over sundowners at the famous Buffalo Bar or while dining at the award-winning MaKuwa-Kuwa Restaurant. This Victoria Falls lodge has 72 newly upgraded rooms with sliding glass doors opening from a light spacious interior onto a private balcony, which offers superb views of spectacular sunsets and bushveld. Soft earthy colors complement the African-themed elegant ambience. Tongabezi Lodge is a romantic hideaway on the banks of the Zambezi River just upstream of Victoria Falls. The lodge’s friendly team welcomes guests to a selection of houses and cottages, each beautifully styled with furniture and embellishments from all over Africa. Guests can dine beside the river or on their private terrace. Privately owned and run, Tongabezi combines an exclusive ambience with the legendary warmth and hospitality of the people of Zambia. Victoria Falls Hotel, one of the world’s classic luxury hotels, commands prime location overlooking Victoria Falls, Zimbabwe, an acclaimed Natural Wonder of the World. The Victoria Falls Hotel features 161 rooms and suites which are luxuriously appointed with warm, inviting décor, and are equipped with complimentary Wi-Fi, Satellite TV, minibar, and private bathrooms. The hotel features the Edwardian Pool is surrounded by lush tropical gardens, a small but well-equipped fitness room, and a beauty spa offering a range of massage and body treatments. The Victoria Falls Hotel presents a connoisseur’s delight of dining options, with internationally-trained chefs creating exquisite dishes. 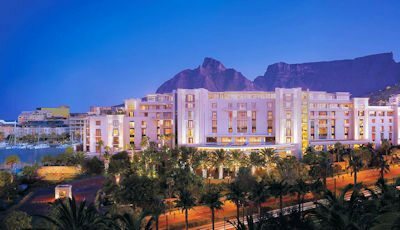 An urban chic waterfront resort with unprecedented levels of luxury, One&Only Cape Town is a place of friendly calm and gracious hospitality for couples and families alike. The rooms are spacious and sophisticated, and are all equipped with air conditioning, Satellite TV, a minibar, and private bathrooms. The sublime calm of the city’s most expansive spa offers an indulgent escape, while NEO Boutique debuts an enviable collection of designer fashions. Discerning travelers are invited to discover the celebrated cuisines of Nobuyuki “Nobu” Matsuhisa and Reuben Riffel, socialize in the high-energy vibe of Vista Bar & Lounge and sample rare and undiscovered vintages at the stunning Wine Loft. Resting lightly upon the ground within a 33,000 acre, private concession in the Kruger National Park, Singita Sweni Lodge is nestled beautifully amongst hundreds of trees at the edge of the Sweni River. In this tranquil, intimate hideaway, the decks of the lodge seem to hover in the branches, while inside, rich calming colours and textures echo the hues of the natural surroundings. The Chobe National Park riverfront is quite simply one of the most impressive safari experiences in Africa. The lodge is the classic luxury safari option for those wanting to visit Chobe National Park, Victoria Falls and the surrounding areas. The 42 rooms are all river-facing, with spacious decks and air-conditioning, as well as a complimentary mini-bar. The large swimming pool and waterfall is a wonderful place to relax during a hot afternoon. With six comfortably furnished viewing decks, a riverside boma, two bars, six different lounges and four dining locations, it is easy to understand why guests effortlessly find their own space and just enjoy the environment! Boasting panoramic views of African sunsets, seven spacious luxury tents are set right on banks of the mighty Zambezi. Decorated in earthy hues, each tent features a comfortable sitting area, as well as a private viewing deck ideal for watching the hippo wallow in the river. Carefully positioned for ideal views of the river, the main lodge area welcomes guests with its open design, while the gift shop is stocked with an exclusive selection of high quality arts and crafts from talented local artists. We’re on our last day at Kagga Kamma and I wanted to let you know that we are having a great time and everything is according to plan. We all loved Cape Town and Franschoek. While we were unsure about KK when we arrived, it has turned out to be a great experience. Just today we saw ostrich, eland, wildebeest, red hartebeest, zebra, botinbok, Springbok and cave paintings. Ted and i are taking the ATV’s this afternoon. It is a huge reserve here. The weather today is sunny and cool. Off to the airport in early morning to fly to Kruger. Hopefully the last leg of our trip will be as good as the first. It is difficult to put into words how much we enjoyed our holiday. We were both a little nervous having heard a number of negative reports about potential problems in South Africa, but we never felt ill at ease, and the people we met were all extremely friendly and helpful. The scenery is breathtaking, and we both want to go back and explore some more. Thank you again for organizing another fantastic holiday for us! We had an amazing time. Africa exceeded every expectation that we had. The weather was outstanding, the food was good. The guides (with the exception of Johannesburg) were great. I only wound up taking 687 pictures. I’m now trying to get these into my computer and into a file that I can send to my friends. They all want to see what we experienced. I have mentioned Yampu several times to friends, telling them how pleased we were with your services. We won’t hesitate to recommend you and Yampu in the future. Thanks for playing such a great role in making this a most unforgettable vacation.